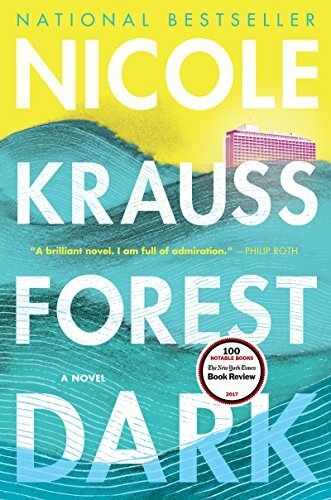 Forest Dark, Nicole Krass’ fourth and most interior, introspective, cerebral, and autobiographical novel to date, is about two Jewish-American characters. Jules Epstein, a 68 year old recently divorced and retired lawyer, and Nicole (no surname), a 40-year-old novelist and mother about to leave her failing marriage, experience personal growth in post-separation states of “hair-raising aloneness” during extended stays in Israel, arriving in 2014 toward the end of the Gaza War. Though both characters initially stay at the Tel Aviv Hilton they never meet. Their narratives are told in alternating chapters, his in the third and hers in the first person. In 2014 Krauss and her former husband, the novelist Jonathan Safran Foer, divorced. Foer’s 2016 novel Here I Am (reviewed on NYJB) also features a first-person narrator’s account of the end of a marriage, but that novel and the one under review are works of fiction. Perusing them for literary gossip is the most superficial and least rewarding way of reading them and is also pointless, since their authors’ real life divorce was amicable. But readers do need to understand the causes of a character’s unhappiness, and Nicole the fictional character attributes the failure of her marriage to her and her husband’s different and incompatible temperaments. Hers is intuitive and inward looking, while his is fact based and outward looking. Nicole’s intuitive receptiveness to the unseen is aided by the prolonged border region between wakefulness and sleep experienced during two illnesses, first at home in Brooklyn and again in Israel late in the novel. Living in a stifling marriage has inhibited her ability to plan for or envision a future: “To plan things, one must be able to imagine oneself into a future that is an extension of the present, and it seemed to me that I had ceased to imagine that, whether out of inability of lack of desire.” She also experiences writer’s block. Unlike Nicole’s conflict averse husband, Epstein is temperamentally argumentative, a trait he inherited from his parents and employed profitably as a lawyer. That career success bought him a Central Park West apartment filled with art treasures, which along with his other possessions he started giving away after the deaths of his parents at the same time he shed his legal practice and his marriage. Illness also influences Epstein who has been living under the Sword of Damocles of a medical condition that should have killed him years ago and may yet do so any day. The purpose of his trip to Israel is to donate two million dollars to a worthy institution in memory of his late parents who as refugees from Europe arrived in Palestine (like one set of Nicole’s grandparents) and where Epstein was born and initially raised before the family moved to America when he was a child (like Nicole’s father). With the lure of the donation Epstein meets with Zubin Mehta of the Israel Philharmonic Orchestra, museum directors, and the head of the Jewish National Fund’s forestry department. Nicole was conceived in the Tel Aviv Hilton where she, her parents, and siblings stay for week long visits once a year thereafter. Like the author, her brother lives in Israel, her sister owns an apartment in Tel Aviv, and both of the novel’s central characters have Israeli cousins. But for Nicole “this openness and immediacy made me feel more alive and less alone; made me feel, I suppose, that an authentic life was more possible.” Yet she is taken aback by the claims her Israeli fans make on her Jewish themed fiction. An elderly woman with a number tattooed on her forearm tells Nicole that reading her books makes her feel like she is spitting on Hitler’s nonexistent grave, and another reader insists her novels do not belong to her but to the Jewish people. Epstein and Nicole are each recruited to the pet projects of colorful Israeli characters. Epstein accepts Rabbi Menachem Klausner's invitation to spend Shabbat at his Gilgul Institute in Safed in the Galilee, declines to attend Klausner's Jerusalem reunion of the descendants of King David whose numbers Klausner insists include Epstein, but agrees to fund a movie about the biblical king. The Hebrew word gilgul means wheel, turning, transformation, reincarnation, and is the Yiddish and Hebrew title of Franz Kafka’s novella The Metamorphosis. Nicole meets her cousin Effie’s former colleague Eliezer Friedman, a retired literature professor, Mossad officer, and diplomat who believes that Kafka faked his own death in Prague in 1923, immigrated to Palestine where the dry weather cured his tuberculosis, and lived under a new name until his death in 1956. And although Nicole does not read or write German Friedman wants her to finish Kafka’s unfinished play and get it produced as a movie. The plot device of a famous author who outlived his or her commonly believed death date is reminiscent of Philip Roth’s 1979 novel The Ghost Writer, in which the narrator suspects that a woman he meets at a famous writer’s home is Anne Frank, who survived the Shoah and is living anonymously in America. Krauss’ prose style, including multipage paragraphs, is also Rothian. In the Nicole chapters her erudition and ability to discuss at length and in depth topics from diverse disciplines knowledgeably and insightfully calls to mind the late Susan Sontag. It would be an interesting experiment to skip chapters and read the Epstein narrative and then that of Nicole separately. Readers who prefer conventional narrative will likely favor the Epstein chapters while those who prefer ruminative, cerebral post-modern fiction will favor the Nicole chapters. By alternating the chapters Krauss deploys the Epstein chapters to provide narrative structure while Nicole’s introspective reflections and digressions give the book emotional and intellectual depth. In writing her way out of a personal trial Krauss has expanded her range.